The hotels in and around Birmingham are more than simply a place to lay your head overnight. From location and amenities options to reputation and price, the right accommodations can make all the difference in your overall experience. Find a place that’s right for you. Historically significant. Eclectically funky. Progressively southern. Get a feel for the individual enclaves that make our city truly special. Click on a neighborhood to learn more. An explosion of retail space, hip new lofts, professional baseball and a slew of breweries, restaurants, coffee shops and bars have made downtown Birmingham a must-experience to everyone who comes here. All day. All night. And then some. Conveniently located between downtown and Southside, Lakeview is one of the most bustling areas for entertainment, retail, design and food. Add to that residential lofts, performance and event space and the hottest nightspots in town, and it’s easy to see why this area is such a draw. Situated at the base of the forested northern slope of Red Mountain, the historic Southside community is one of the most cosmopolitan neighborhoods in Birmingham, with Five Points South being a central hub for art, nightlife and entertainment. The hippest haven in the ‘ham. Originally built to be a company town for Avondale Mills, the neighborhood is now an emerging nightlife and entertainment hotbed. The newest restaurants, breweries and live music venues make Avondale one place not to me missed. Taking quaint and charming to the next level. Small town southern life meets vibrant, contemporary retail, dining and entertainment options in this easy-to-find, easier-to-get-around neighborhood. Welcome to the Tiny Kingdom. Located in a quiet, secluded enclave and noted for its boutique shopping, the so-called “tiny kingdom” has upscale shopping, fine dining, spa treatments and greenspaces that all come together to create an experience as luxurious as it is memorable. Home to some of the oldest neighborhoods in the state, community revitalization has created a resurgence of businesses, churches, community events and neighborhood festivals. Mining towns turned local treasures. Having sprung up around an industrial post-Civil War coal mining boom, through the years these communities have developed an undeniable southern charm while still maintaining their rich and storied histories. Down home communities. Upscale vibe. Best known for its wide variety of retail shopping, including the Riverchase Galleria, the area is also home to quaint subdivisions, nature preserves, sports complexes and more than its fair share of dining options. East of town. North of expectations. One of the most surprising and unexpected areas of Birmingham is steeped in history and home to world renowned retail shopping, a global television network and an international raceway and motorsports museum. Nestled in Jones Valley in the foothills of the Appalachians, Bessemer is conveniently located to interstates and airports for easy access to shopping, outdoor activities and family adventure. Being located along one of the main arteries into and out of the heart of downtown means the shops and restaurants here have a local suburban feel while being easily accessible from anywhere. Not only do we have world-class courses designed to challenge you during the day, but there's also plenty to do once the sun goes down. Hit your clubs in the morning. Then hit our clubs at night. Explore Alabama’s Civil Rights History right here in Birmingham. Bring the kids or just use the opportunity to bring out the kid in you. Bring your appetite and taste for adventure. We’ll satisfy them both. Three days of sharing togetherness, interests and discovery. Need to make a plan? 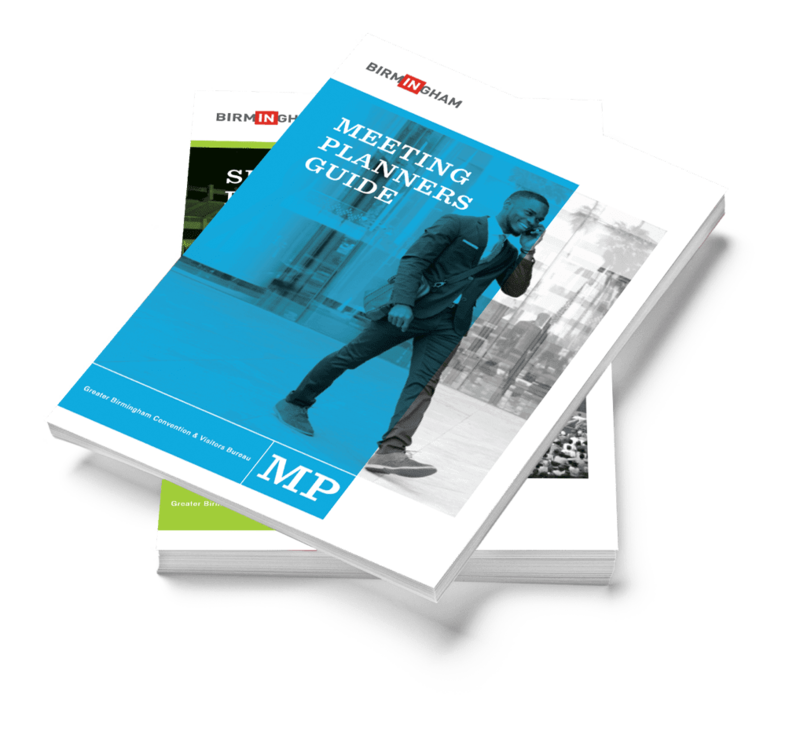 Download one of our guides and we’ll help make the planning process as easy as possible. Through the eyes of the beholders. Don’t take our word about all the great things there are to see and do in Birmingham. Have a look at what the people who come here have to say.